Not too much to say about my musical career or ability, I have none. With no real background in music or playing musical instruments, I finally decided to learn the guitar in 2002 after a family member had their 21st birthday in Sydney. With no real great desire to play live at any stage, I had lots of jam sessions with friends, learning as much as I could. From there my mystical musical ability basically evolved into a journey of “fun and enjoyment”. Something I believe in and follow this mantra today. From a duo doing covers to a rock band doing originals, I was on a great path towards finding the different musical styles that interest me. 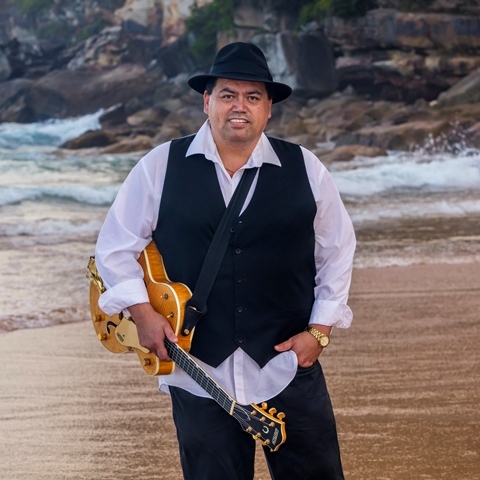 I have played live music throughout Sydney’s pubs, clubs, restaurants, private parties and weddings. I have played in the Central West NSW, Orange, Parkes and the famous Bushtucker festival in Trundle. After playing in a duo/rock band for 8 years, I took a very short break. Two years ago during this time I was asked by my friend Sarah Taranaki if I can help with a charity event, as an acoustic duo. Before our 2nd rehearsal started, we had gone from a duo to a 5piece collective group of musical friends. I am the rhythm guitarist and one of three very special vocalists. Surrounded by very talented musicians, I am enjoying the great experiences that playing music has to offer.